Sometime between 1300 and 1345 on April 6, 1945, Flight Petty Officer 2nd Class Hajime Sayama took off from Kokubu No. 2 Air Base as gunner/radio operator in a two-man Type 99 Carrier Dive Bomber (Allied code name of Val) carrying a 250-kg bomb and died in a special (suicide) attack off Okinawa at the age of 21. He was a member of the Kamikaze Special Attack Corps 1st Kusanagi Squadron from Nagoya Naval Air Group. He was from Ehime Prefecture and was a member of the 13th Kō Class of the Navy's Yokaren (Preparatory Flight Training Program). Preliminaries omitted. I trust that you have been doing well. I am in very high spirits. Today I received an order to make a sortie as part of the Special Attack Corps, and I gladly will go on the mission. You showed concern and care for me in many ways for the long time of 22 years , and it truly is regrettable that I have not repaid any of your kindness. However, I am extremely glad that I have been able to live until the end for an eternal cause and have been blessed with a good place to die. Never, never cry. At the time when you are expressing joy about my death, I probably will start to rise up to heaven. Now I have no regrets. It is a man's long-cherished desire. April 6 will be the date of my death. When I crash dive aiming at an enemy ship, I will crash dive while reciting this poem above . Finally this is the end. Father and Mother, be in good spirits. If a white wooden box arrives , I did not do such a great deed, but please praise me without crying. Off the shore of Okinawa, ships of the hated ugly enemy are swarming. They are trying to spy on our Empire with its glorious eternal history of more than 2,600 years. Since 3,000 years ago, our ancestors have continued to protect the Empire, and we who are their descendants must protect it with our hands. That is the mission and obligation of us who were born in the Empire. For our transfer on the 5th from Nagoya to Kagoshima, our planes passed through the skies over Nyūgawa . Did you know that on the 5th between about 10 and 11 in the morning about 18 planes passed by? I also was riding inside one of those planes. I could not make out my home from the air, but I faced toward Yoshida. I prayed for the health of everyone. The letter comes from Matsugi (1971, 162-4). 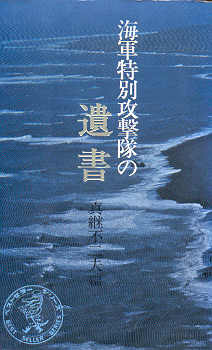 The biographical information in the first paragraph comes from Matsugi (1971, 162) and Osuo (2005, 225). 1. The traditional Japanese method of counting age, as in much of East Asia, regards a child as age one at birth and adds an additional year on each New Year's day thereafter. This explains why the letter indicates his age as 22 whereas his birth date of January 1, 1924, given in Matsugi (1971, 162) indicates his age was 21 at time of death based on the current method of counting age. 2. This tanka poem (31-syllable poem with a syllable pattern of 5-7-5-7-7) is very similar to one composed by Yaichi Kawakami, a 19th-century Imperial loyalist <https://blogs.yahoo.co.jp/sakuramitih15/38793013.html> (August 3, 2018). 3. A white wooden box was how the Japanese military usually delivered the remains of war dead to their families. In the case of kamikaze pilots, the remains such as fingernails or hairs from the head would often be prepared in advance. There are also cases where the white box would arrive at the family's home with no remains. 4. Nyūgawa was a town in Ehime Prefecture. In 1971, it merged with Miyoshi Town to become Toyō Town. In 2004, Toyō became part of Saijō City.